IDENTIFICATION TIP: Who’s Black, White and Red, Too? 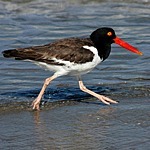 At the beach you see a fairly large black and white bird with a long red or orange beak. What is it? There are two very distinctive birds at many beaches that nest in the same location and look very similar in color…but are very different. 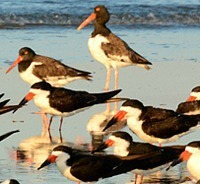 Here’s how to easily tell the difference between the American oystercatcher and the Black skimmer. The first thing most of us see is the black backs and white markings in front with a brightly colored beak. But these birds do really different things and they have the beaks and body styles to prove it. The American oystercatcher has a long straight beak that is very capable of grabbing mollusks, prying them off something if needed and opening them. They stand and sit uprigh t and have long legs on which they can run quickly and are able to easily reach the shoreline to feed. They also are seen in pairs or in small flocks during nesting season…and their call is unmistakable. 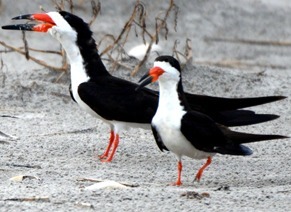 Black skimmers have a much different beak. It’s think and blunt, but most importantly, the lower mandible (lower part of the beak) is a lot longer than the upper mandible. Since skimmers fly very low, skimming shallow water to snap up small fish, this beak acts like a scoop that enables them to pluck fish out of the water as the birds are flying. Skimmers don’t need to walk to the shoreline to eat, as they are nearly always flying. So, they have short legs and are often found sitting or lying stretched full length on the sand – beaks stretched in front. They are often found in huge colonies – numbering from the hundreds to thousands. But in the air they are unmistakable with long thin wings that give them amazing control in flight. Shorebirds aren’t always easy to identify, but these two very similarly marked birds are a breeze to separate once you take a closer look.